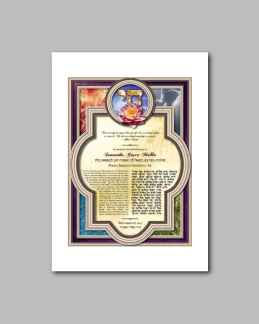 Personalized Bar or Bat Mitzvah Art :: "Chai"
The "Chai" depicted in the central upper window of this design gives this B'nai Mitzvah design its name. Overlaying a field of violet and separated by a silver border are depictions of the four elements: fire, air, water and earth. 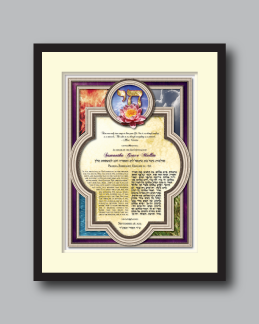 These symbolize the building blocks of our physical world given to us by Hashem. At the top of the design, within the circular silver window, a lush pink lotus seems to open before our eyes. Behind it, in precious gold, is the Hebrew word "Chai", meaning "Life". Within the text area of the design, above the name of the B'nai Mitzvah, is the following inspirational quote by Albert Einstien, "There are only two ways to live your life. One is as though nothing is a miracle. The other is as though everything is a miracle". 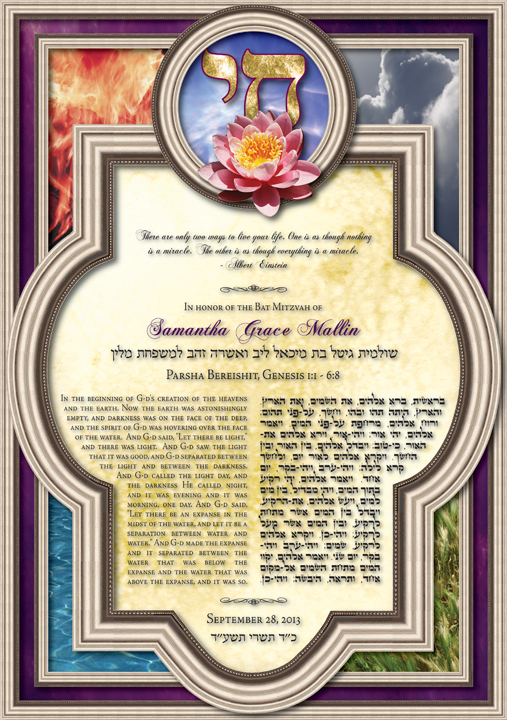 These words, along with the imagery of the four elements, and opening lotus, are meant to inspire the Bar or Bat Mitzvah boy or girl to understand that each of our lives and all that we have are a miracle and a gift from our Creator .